The City of Cincinnati is the only municipality in the country to own an interstate railroad. 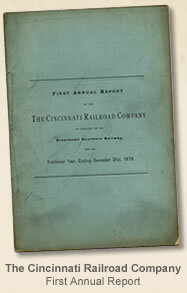 An Ohio law enabling the creation of the Cincinnati Southern Railway was enacted on May 4, 1869. Cincinnati voters adopted a resolution designating Chattanooga as the southern terminus one month later. Workmen spiked the last rail in place on December 10, 1879. The first freight train completed the route from Cincinnati to Chattanooga on February 21, 1880. The first passenger train followed on March 8. Thus began an innovative, visionary and complex commercial enterprise intended, from its first considerations in 1835, to expand the economy of Cincinnati. The enterprise continues today, under a long-term lease with Cincinnati, New Orleans and Texas Pacific Railway (CNO&TP), generating revenue annually for capital infrastructure improvements and repair throughout the City of Cincinnati. Please explore the Web site to learn more about the Cincinnati Southern Railway. Discover the history of the Cincinnati Southern Railroad with this interactive timeline. Learn how Cincinnati's strategic location allowed it to be a post-Civil War gateway to the South and how completing the railway was a difficult and often dramatic process. Learn more about the Cincinnati Southern Railroad’s current bylaws and lease with Norfolk Southern Corporation, as well as view meeting minutes of the CSR Board of Trustees.